A Duke nail-biter gave a big boost to CBS. CBS: With help from the Duke vs. UCF NCAA TOURNAMENT game that bled into primetime, 60 MINUTES jumped to a preliminary 2.1, and GOD FRIENDED ME was up 0.2 to 1.0. NCIS: LA held at 0.9, and MADAM SECRETARY rose 0.2 to 0.7. 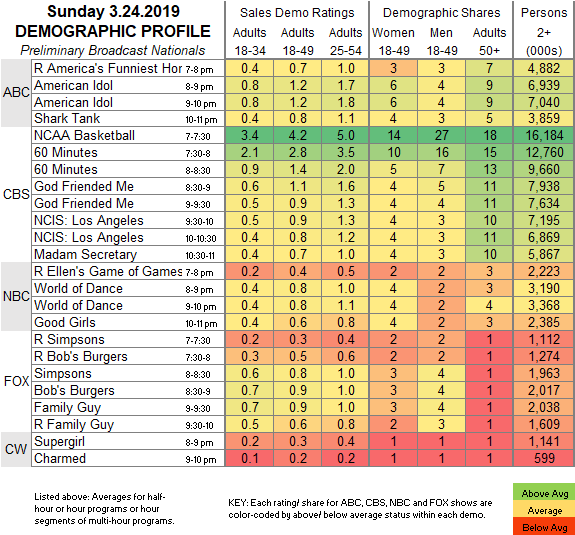 ABC: Following 0.7 for a rerun AMERICA’S FUNNIEST HOME VIDEOS, AMERICAN IDOL sagged by 0.1 to tie its series low 1.2, and SHARK TANK was down 0.1 to 0.8. NBC: After 0.4 for a rerun ELLEN’S GAME OF GAMES, WORLD OF DANCE was steady at 0.8, and GOOD GIRLS gained 0.1 to 0.6. FOX: THE SIMPSONS (0.8) and BOB’S BURGERS (0.9) were steady, and FAMILY GUY was up 0.1 to 0.9. They were flanked by reruns at 0.3-0.6. CW: SUPERGIRL (0.3) and CHARMED (0.2) stayed as-is. Tonight, AMC’s INTO THE BADLANDS moves to its new Monday slot, and History’s KNIGHTFALL returns for its 2nd season. CABLE RATINGS: Come back this afternoon for detailed demographic ratings for top Friday cable programs. Saturday & Sunday cable ratings will be posted Tuesday morning.